Third – get the best childcare situation you can possibly afford. Childcare is incredibly expensive, especially for very young children, and even more so early on in one’s career when you are not earning as much. Sometimes if feels like you’re a hamster on a wheel, just working to pay for childcare. But if you get past that and focus on the long view of your career, childcare choices can have a huge impact on minimizing the day-to-day juggle. Depending on where you live, once you have two children in daycare it can actually be less expensive to have a nanny. Yes, I know this is a complicated choice with many factors, but as it relates to work/family balance, not having to worry about getting the kids fed and dressed and dropped off at daycare in the morning while trying to get to the office for a big presentation is really a godsend. If in-home childcare isn’t right for your family, at least make the logistics the easiest possible (see my last post regarding commute). Fourth – cut the cable. And by that, I mean the cable TV. There are simply not enough hours in the day. According to AC Nielsen, the average American watches 4 hours per day. Not even touching the controversy over how harmful this might be, cut this out and suddenly you have a chance of fitting in the more important stuff. Fifth – is there a “two for” in your day? When my kids were little, like a lot of working moms, I really missed having time just to socialize with my friends. I also wasn’t getting enough exercise! My “two for” solution was to start hiking with friends, sometimes with the stroller (a “three for”?). Years later this has become one of my favorite activities – I hike most weekend days and many weekday early mornings before work. I don’t have time to do many lunch dates but I really enjoy my hiking dates – it’s a great way to catch up with friends, not to mention enjoy the outdoors. 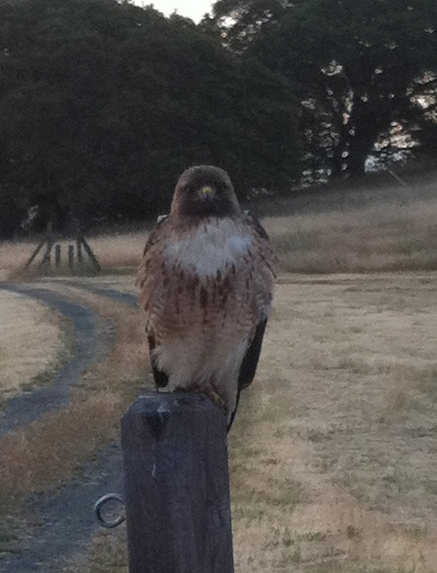 In fact here’s a picture I took with my iPhone of a beautiful Cooper Hawk I saw during a recent early morning hike at the Stanford dish.